I had visions of dragging out this saga over several blog posts…a photo by photo, day by day serial, if you will. But in the interest of keeping Mel from becoming an 8:45 am alcoholic, Tracey from causing an international incident at the border, and Leslie from calling the Sweater’s Aid Society on me…well, just watch and see. First let me say this is all the Techknitter‘s fault. Do you know of Techknitter? 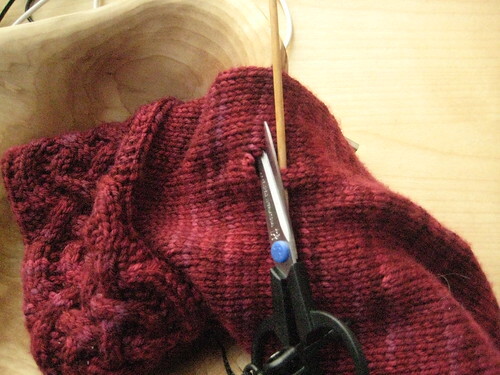 LOVE the Techknitting blog. It’s made my left leaning decreases oh so Beauuuutiful now, instead of all lumpy and bumpy. 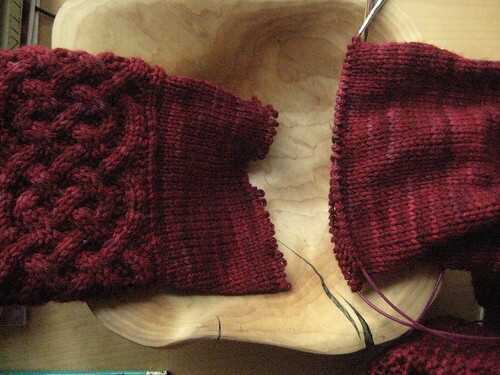 And just when I thought I’d have to live with the way too long Susie-sleeves, well along came a Ravelry link to the Techknitter’s article on SHORTENING too long knitting (or lengthening, which I’m sure is important to someone out there…just never one of my problems)! Because the cuff is knit sideways and the sleeve knitted up from the cuff, there were no live stitches to worry about on the cuff side. All that was left was to stitch the cuff to the live stitches. I tried a few things (3 needle bind off, stitch to stitch sewing, mattress stitch) before deciding on a modification of kitchener grafting which left a nice flat seam. (Susie thanks you all for your notes of concern and assures you that she is quite attached to indigodragonfly…thanks in part to the unraveled yarn that keeps them tied together. This entry was posted in Uncategorized and tagged FO, Susie Hoodie, technique, the (in)sanity of knitters by indigodragonfly. Bookmark the permalink. gutsy move—nicely done… can’t wiat to see your internationally famous Susie in person! Now hows about a modelled *after* shot?? Very nicely done. 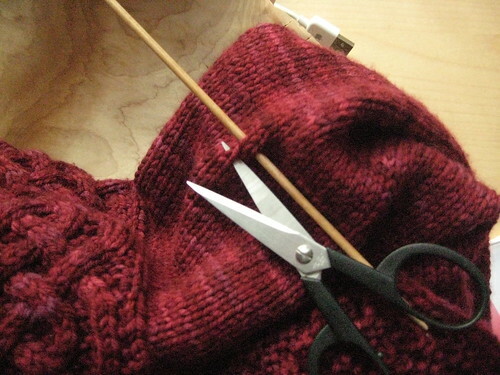 Cutting in to your knitting is strangely empowering. I also feel your pain, I had to do exactly this to my Shimmer shrug a few years ago. Not just once, but twice. And AFTER I had already recalculated the sleeve length and decreases, and knit it four inches shorter than the pattern, because I know I have very short arms. I finished it, wore it once, and decided I hated the ruffle sleeves beyond reason. So I knit lace bands, cut the ruffles off, ripped back another inch for good luck and attached the lace. And it was still too long for my liking – I prefer cuffs that stop right at the wrist. I took off the lace again and ripped back another inch. Okay, my arms are REALLY short. Alas, I didn’t take “during” pictures, only before and after. 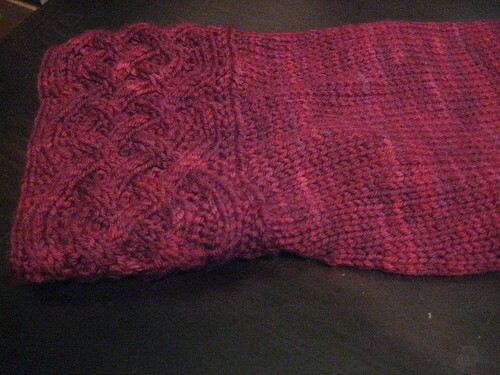 It also took me a couple weeks of staring at it to bolster my courage, and decide what lace pattern to use. Nice to meet you on Saturday! While it’s always good to accumulate some “ride car-ma”, meeting people is the real bonus. And I got to see the Susie in-person… I can’t believe I neglected to compliment it then. My occasional lack of certain social graces sometimes astounds even me. Beautiful work on the Cardi Kim. You are truly one of the best knitters I know. Peace! So I was reading a review of a knitting bag on another blog and noticed you on the sidebar and here I find myself writing you to say hi! I love the scarf you made me and get compliments everytime I wear it! It is sensational with black! I love your pics and tutor on shortening sleeves. The cardigan looks great on you! I love the color, style and yarn! Nice to see you! I know there is a happy end, but I still cringe at the act of cutting… On the other hand it looks like a practical thing to dare! Oh, and the result is very good indeed! I made the susie hoodie and my sleeves were find thanks to you and others who said to work less rows. I made knttys Emeral and the sleeves are way too long (my screw up not the pattern) and I am going to try shortening them. I printed out the Techknitting instructions and the pictures of your project. 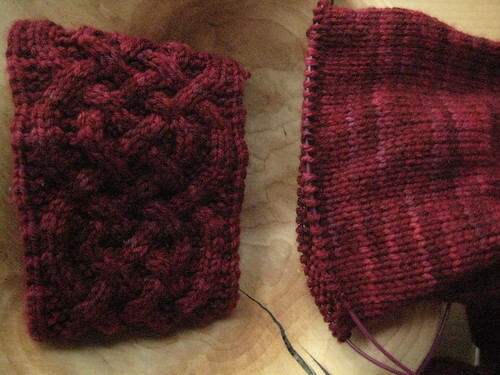 My sleeves have a ribbed cuff do you think that will make difference? I will blog about it and mention both you and Techknitting. Check out a group I started on Ravelry Lesser Known Skeins you may like to join.